Alx Blockhttp://alxblock.comI'm a Store Harmonizer with Automattic and WordPress.com. I rock out with my kids, and have a lot of fun ALL of the time. Here’s a really nice view of the office that I work from every day. Or take a look at the full version. My mom. She lived. She died. She’s here. I’m not good with talking about my emotions publicly, openly, and without hesitation. I’m not good at feeling angry or upset or confused. I’m not good at knowing that my life is changed forever. What I am good at, though, is realizing that just because my life is changed that doesn’t mean that life is going to be bad. The raw pain will turn into a dull one and I’ll soon be able to see myself living again. Being a father. Being a husband. Being an Automattician. It’s been three weeks since my mother died. My mom. The woman who had so much faith in me that I learned to have faith in myself. The woman who loved me so much that I learned to love myself. The woman who was so optimistic about my future that I became optimistic myself. She died. I’ve been visiting her grave and speaking out loud like a lunatic. When I visit, I feel like I hear her. She tells me to stop visiting because I can talk to her from anywhere. My mom. She died. There are moments when I feel like I can’t breathe and I don’t know how to have faith or love or be optimistic. And then there are moments when I’m determined to make the most out of every second that I have left. My mom. She died. She was 62. When I think about her final years, I think about how much she lived. My mom never struggled. She never fought. She never battled cancer. She lived with it. She took what was a devastating and horrible turn in her life and she lived. She traveled. She loved. She laughed and danced and sang. She married people. She continued to grow and learn about herself and become the best that she could be. My mom. She lived. She died. She was 62. I know that she’s here with us. I still ask her advice and I still lean on her for support. She’s around us and she always will be. She weaved her soul into me from the moment I was born. Teaching me, learning from me, growing me. My mom. She lived. She died. She was 62. She’s here. My mom. My mom lived and then my mom died. She had 62 amazing years. I’d rather live with the gigantic hole in my heart than have had my life be any other way. I’m so lucky that I got to know her. My mom. She’s here. In the wake of Heartbleed, I decided that I didn’t want to be alone when I went through and changed all of my passwords. 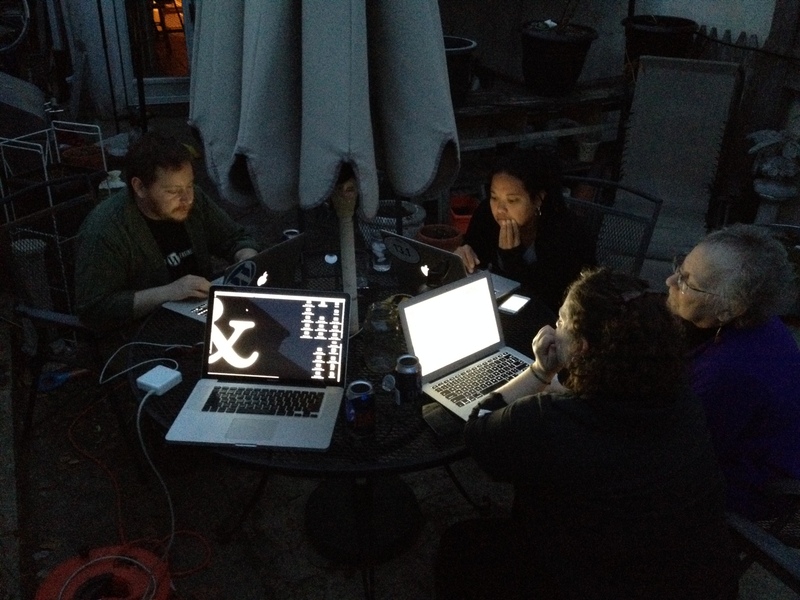 So we had a “Change All Your Passwords” BBQ. Good friends, laptops, (secure) wifi, food, and beer. It doesn’t get much better than that. At work we use IRC to communicate. It’s an old technology, but it’s really awesome. I’ve come to think of IRC as my home base. It’s the place where I chat with my colleagues across the globe and get to enjoy their company. With distributed work, it’s the best way to feel connected with people. Because it’s my home base, I’ve always wanted to make it mine. I’ve made a few tweaks here and there, but I realized quickly that the only way to truly customize it is to write a script. A friend of mine at work loves burritos. Every Friday (I suppose, out of companionship,) we have what’s called Burrito Friday. That means that no matter where you are in the world, you eat a Burrito of some kind. I personally don’t have too many options for Burritos in Philly, so I’ve decided that Burrito Friday is a state of mind. That means that anything that I eat on Friday is a Burrito. My friend hates that. He hates it so much that I just can’t stop giving him a hard time about it. What’s the point of giving someone a hard time if you have to do it manually? So I wrote a script1 to do it for me. Now all that I have to do is type /burrito in Linkinus to give him a hard time. The beautiful thing about this is that it’s super-simple. This is such a basic script, but it allows me to customize my home base in a way that’s meaningful to me. I’m excited to try more things and see what I can come up with next.